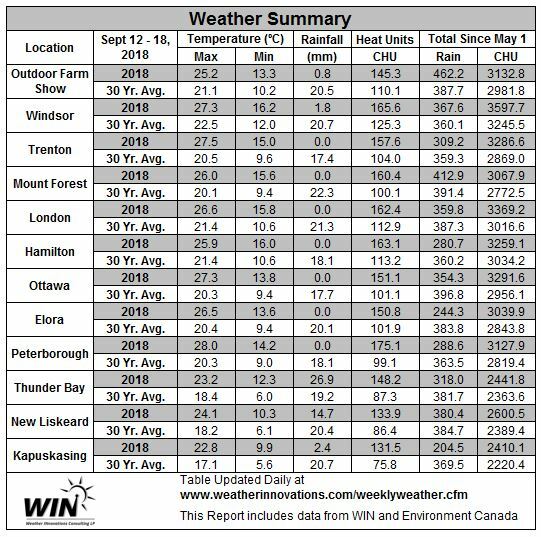 With assistance from the Ontario Agri-Business Association (OABA) and funding through the Grain Farmers of Ontario (GFO), the Ontario Ministry of Food and Rural Affairs (OMAFRA) has begun sampling grower corn fields to determine ear mould incidence and occurrence of mycotoxins in the grain. These mycotoxins, particularly vomitoxin (DON) produced primarily by Gibberella ear moulds can be disruptive when fed to livestock, especially hogs. The purpose of this annual survey is to assess grower and industry risk. 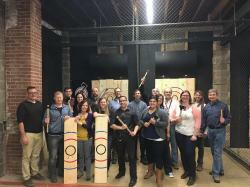 What can growers do? As corn producers plan for harvest they should be scouting their fields for stalk rot and ear moulds. The distribution and prevalence of these diseases vary from year to year, but they are present every year, especially when the crop is planted late, under stress (water stress, insect feeding, etc.) or a very susceptible hybrid is planted. A pre-harvest assessment can alert you to potential problems and provide time for livestock producers to segregate, obtain alternative grain, or hold onto stored corn from the previous year. Scouting practices are similar for all corn ear rots. 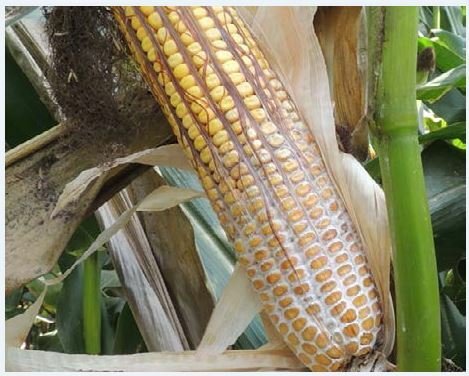 Begin scouting fields at late dent stage to determine the presence and severity of ear rots. A quick method is to select 100 plants across the field (20 ears each from five different areas). For each ear, be sure to peel back the husks and examine the entire ear. Fields with 10% of ears having significant mould growth should be harvested sooner than later. Leaving diseased grain in the field allows the ear rot fungi to keep growing, which will increase the risk of mouldy grain and mycotoxin contamination. Most ear rot fungi continue to grow (and potentially produce mycotoxins) until the grain has less than 15 percent moisture. In severely infected fields, it may be worthwhile to harvest grain at higher moisture and then dry it to less than 15 percent to minimize further mycotoxin accumulation. If a field contains a significant level of ear mould, collect a representative sample at harvest and have it tested for mycotoxins before storing the grain or feeding it to livestock. A lab test is often the only reliable way to definitively diagnose an ear rot or mycotoxin. Adjust harvest equipment to minimize damage to corn. Clean corn thoroughly to remove pieces of cob, small kernels and red dog. Exercise caution in feeding mouldy corn to livestock, especially to hogs. Pink or reddish moulds are particularly harmful. Suspect samples should be tested for toxins. How can you tell the difference between the 3 primary ear moulds found in Ontario? 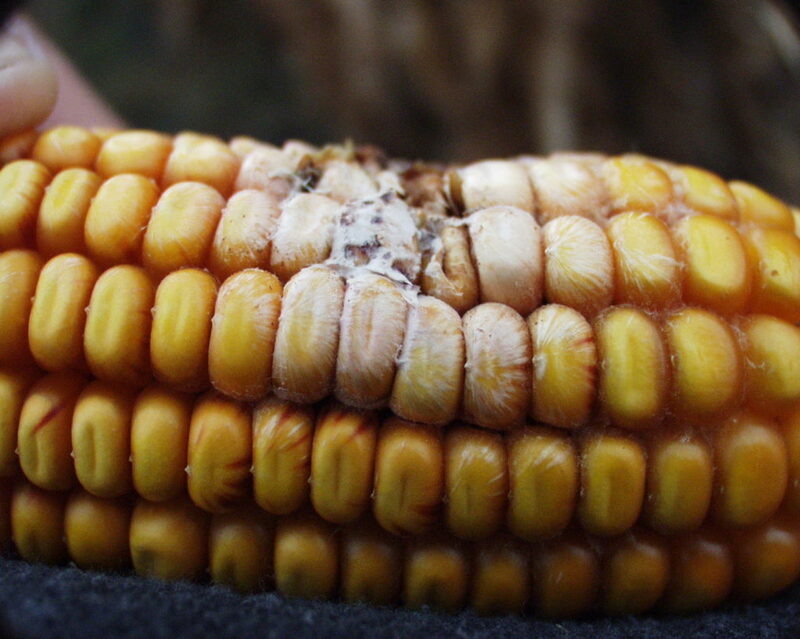 Gibberella Ear Rot: The most common and important ear mould in Ontario is caused by Gibberella zeae which is the sexual reproductive stage of Fusarium graminearium. This fungus also causes FHB in small grains like wheat and can survive on soybean roots. Although the fungus can produce a white-coloured mould which makes it difficult to tell apart from Fusarium Kernel Rot, the two can be distinguished easily when Gibberella produces its characteristic red or pink colour mould (Figure 1). Infection begins through the silk channel and thus, in most cases starts at the ear tip and works its way down the ear. In severe cases, most of the ear may be covered with mould growth. Corn silks are most susceptible 2–10 days after emerging. Warm and wet weather during this period is ideal for infection. 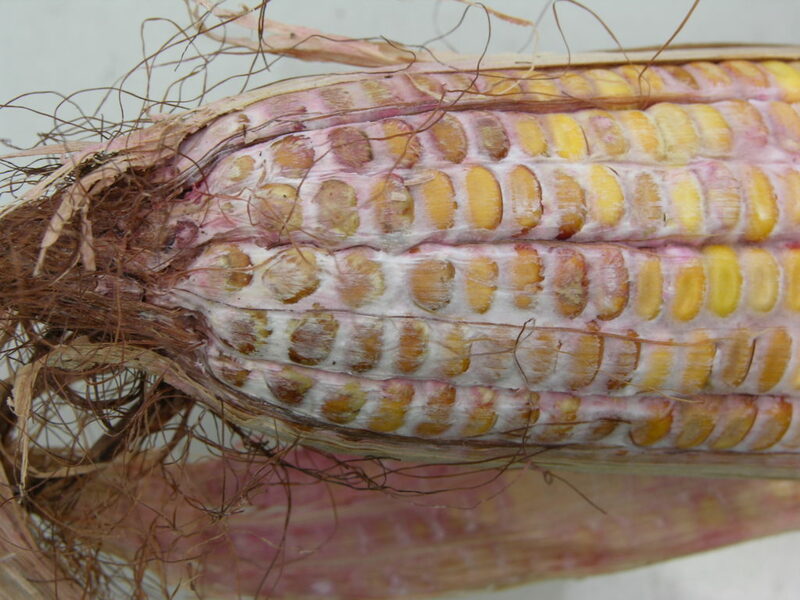 Fusarium Kernel Rot: Unlike Gibberella, Fusarium infected kernels are often scattered around the cob amongst healthy looking kernels or on kernels that have been damaged for example by insects or birds. Fusarium infection produces a white to pink or salmon-coloured mould. A “white streaking” or “star-bursting” can be seen on the infected kernel surface (Figure 2). Although many Fusarium species may be responsible for these symptoms, the primary species we are concerned about in Ontario is Fusarium verticillioides. Fusarium survives in corn debris. The significance of this fungus is that it produces a toxin called fumonisin that has been shown to cause cancer (carcinogen) in humans. The environmental conditions that favour disease development are warm, wet weather 2–3 weeks after silking. Diplodia Ear Rot: The characteristic ear symptom of Stenocarpella maydis and S. macrospora infection is a white mould that begins at the base of the ear which could cover and rot the entire ear (Figure 3). Mould growth can also occur on the outer husk which has small black bumps (pycnidia) embedded in the mould. These reproductive structures are where new spores are produced. Pycnidia (the small, black, spore-producing structures of the fungus) overwinter on corn residue and are the source of infection for the subsequent corn crop. Dry weather before silking, immediately followed by wet conditions, favor Diplodia infection. More information can be found in OMAFRA’s Field Crop Agronomy Guide – Publication 811 (http://www.omafra.gov.on.ca/english/crops/pub811/14toc.htm), or Crop Protection Network Publication “Corn Management Disease Series – Ear Rots” at CropProtectionNetwork.org or on the Grain Farmers of Ontario Website (http://gfo.ca/Production/Production-Resources).